There is not a common set of school supplies for high school students. All of our students’ schedules are different and their teachers have different approaches to meeting the curriculum. Different teachers of the same subject may request different supplies. 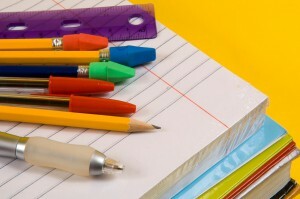 We recommend that each student have a three ring binder with paper, pens and pencils to start with the first few days. After that, the students need to learn what the teacher recommends and purchase the supplies as needed.